Today, our main office is the winery at Selva, inside the Gambellara zone, where all production for Cavazza takes place: the winemaking area, barrel room, bottling and storage, fruit drying room, a tasting room and wine shop. When we talk about “controlling the entire production line,” we mean it. In our winery, we personally follow each step, from the first buds to shipping the bottles to your address. It all starts here: from our home to yours. We are firmly attached to the land, without which nothing would be possible; from the roots that have given life, to the tops of the rows in the fields, viewed by dreamers projecting us towards new challenges and new horizons. We inherited a precious legacy based on respect, dedication and care: for the product, our clients, the environment, and for the evolving world around us. This is the key to our business, from the moment the first cluster sprouts until we cork the new bottles. We know how important the bond is between land and livelihood, and because of this we work to protect the landscape and its biodiversity. There is a transparency in the traceability of our wines, and we pay meticulous attention to the excellence required in every step to achieve the highest level of quality. It is easy to tell you who we are because we are what we do. The world of wine, always evolving, pushes our efforts to renew and innovate, discovering uncharted paths with enthusiasm, and embracing the new ideas that arrive. We’re always growing, working to better and perfect ourselves. We live our 100-year-old story, and it is our responsibility to honor and continue writing it; in different words than those that came before us, perhaps, but with the same soul. It’s difficult to translate what it’s truly like to work on a farm with a company that bears our name, born four generations ago. However, it is easy to tell you who we are because we are what we do. It’s our own hands that care for the vines, daily putting into place the lessons we grew up with; and armed with these traits, we are able to courageously experiment. We closely follow our vines throughout the year, promoting the balance between their vegetative and productive stages based on the grape variety and systems used. We’re with our vines as they face every new season: winter pruning, shearing and suckering in the spring, green harvesting done by hand under the summer sun, and finally to the spectacle of the autumn harvest that decades later still fills our hearts with emotion and pride. From its beginning, Cavazza is synonymous with continuous innovation and experimentation. Examples of our innovative choices today include the use of the mating disruption technique to prevent the attack of pests, and the adoption of new systems such as “l’inerbimento del’interfilare” (removing wild vegetation between the rows), managing weeds through arboreal competition and mechanical weeding, and using green manure to replenish soil fertility. Despite our appreciation for innovation, Cavazza is also about having a deep connection to tradition, which always plays a large part in our daily work. It’s a tradition that culminates into a celebration in September, when we gather the ripened grapes exclusively by hand, bunch after bunch. It’s in these precious moments that time stops. If we close our eyes, we can still imagine our grandparents Domenico and Pietro walking between the rows, checking the vines with loving gestures. We now come to the final stage of this journey, where the roads of whites and reds are divided: the former, after decanting, passes on to the glass, while a portion of the latter continues refining in wood in our underground cellar, until bottling. This is where our work ends and your pleasure begins. 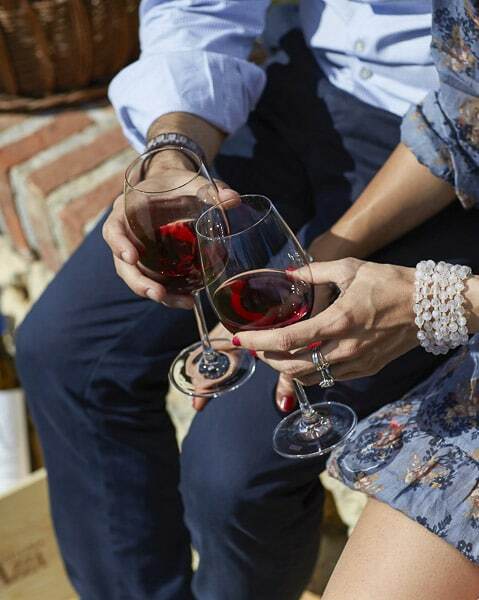 We’d like to think that whomever holds a bottle of Cavazza wine in his hands, can feel and connect with all of our traditions, commitments, ideas, and our passion.